On Monday April 8, 1968 Barbara Jane Harrison put on her designer BOAC uniform and made her way to London’s Heathrow Airport (LHR) to join ten other cabin crew members operating Flight 712, bound for Sydney Australia Via Zurich and Singapore. She had worked with the company on their Boeing 707 fleet for almost two years. Little did she know that in a few hours, she would go down as one of the bravest women in aviation history. All seemed normal, as the 116 passengers boarded the Boeing 707-465 (G-ARWE) and were treated to BOAC’s exquisite onboard service. A short while after 15:00GMT, the aircraft pushed back from the gate and made its way to the runway, finally taking off at 15:27. 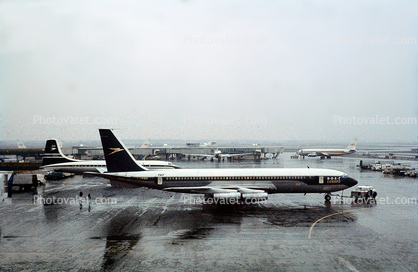 BOAC Boeing 707-465 G-ARWE (Whiskey Echo). The aircraft involved in the crash. But a few seconds after the planes wheels had left the tarmac, disaster struck. A loud and unexpected bang shook the aircraft. Just two minutes after take-off a “Mayday” was issued, requesting an immediate return to LHR. At first it appeared that a fire had taken hold in engine #2, but it was much worse. On the ground those in the control tower watched in horror as the aircraft climbed away, its whole wing on fire. They quickly radioed the emergency services and gave the pilots a direct routing back to Heathrow, but by this time the fire was burning uncontrollably. As the aircraft attempted to return to the airport, the engulfed engine broke away and fell to the ground, the terrifying moment captured by onlookers on the ground. Horrified onlookers on the ground captured the moment the burning engine broke away from the aircraft. One can only imagine the sheer terror onboard, as windows at the rear port side began to melt from the intense heat. In the cabin, the crew went through their safety drills and briefed the passengers. Stewardess Jennifer Suares later spoke of how she continued to repeat the emergency landing drill, even though she was unsure they would even make it back to Heathrow. 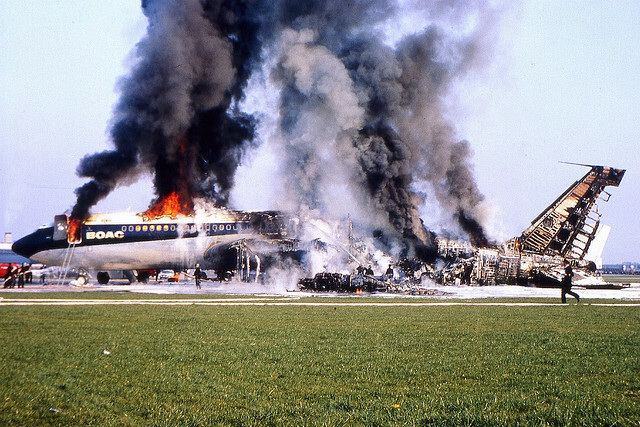 Just 3 minutes and 32 seconds after take off, the 707 was back on the ground, flames licking the fuselage. The landing was perfect and the aircraft quickly came to a halt. In the flight deck, the pilots began to shut the aircraft down, while in the cabin, the crews training kicked in and they commenced the evacuation. At the front, passengers began to escape down the emergency slides, however the port slide caught fire before it could be used. At the rear where Harrison had been seated, conditions were horrendous. As they deployed the starboard slide it twisted, proving useless. By now the fire had really taken hold and the slide on the other side was also quickly destroyed. Assisting Harrison was Steward Taylor and realising the twisted slide was now their only means of escape, he climbed down to straighten it out. This left Barbara alone at the top to assist with passengers. Six people managed to escape successfully before it too punctured and deflated. For those at the rear this was now their only way out. Harrison continued to evacuate people this way, pushing those who were too scared to jump. Approximately 22 people managed to escape from the rear of the aircraft. It is hard to imagine what must have been going through Barbara’s mind at this time, yet she continued to carry out her duties. Flames now ravaged the 707, leaving little time for escape. Testimonies from those who had already evacuated, told how Harrison was last seen alive, about to jump herself from the rear door. But something grabbed her attention and she turned back, disappearing into the burning fuselage. It is believed that she went to try to save an elderly passenger, who was having difficulty escaping on his own. Exhausted and choking on the thick smoke that engulfed the cabin, she never made it off the aircraft. Her body was found near the elderly passenger seated in one of the last rows. The burning wreckage, still on the runway. We are always told that if the water is too deep, the fire is too hot and the smoke is too thick, we should save our own lives. That fateful afternoon Harrison, a month away from her 23rd birthday, sacrificed hers to save countless others. Five people were killed in the disaster and 38 were injured, but had it not been for the crews bravery, many more would have died. Passengers praised her courage and calmness during the evacuation. Her colleague Anne Woods later spoke of her bravery, “She had plenty of opportunity to escape but did not feel right about leaving a wheelchair passenger and three others on board. The Captain kept screaming at her to jump”. 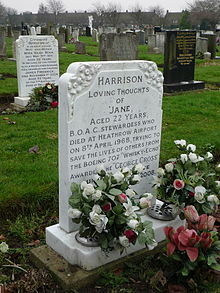 After the fateful flight, Harrison was awarded the George Cross, the first woman to ever receive the award in peacetime and one of only four women ever to receive it. In 1987 British Airways purchased the medal and it is now on display at their archive museum at Heathrow. In 1971, she was awarded the Flight Safety Foundation Heroism Award. Established in 1968, it recognises the bravery of aircraft crew and ground personnel, whose actions exceeded the requirements of their job. George Cross and its Ribbon Bar, awarded to Harrison posthumously after the crash. That sunny April afternoon, Barbara Jane Harrison did just that, and this is why she goes down as an Angel Of The Sky. Harrisons final resting place, Fulford Cemetery York. For more incredible tales of the heroes and heroines of our industry head over to our ‘Angels Of The Sky’ section. I flew for BOAC in the 70’s and the first thing that you saw when you walked into the training centre on your first day was a plaque commemorating this brave lady.she is an inspiration to all of us. Years later when I rejoined BA I was horrified to see on my first training day that the plaque had been removed although the training centre has been rejigged since the wal is still there and sadly no mention of this brave lady. So sad……. Hi Roz. Thanks for your comment and I hope you liked the article. So glad to see that BOAC recognised Barbara. It’s a real shame that British Airways don’t have the same feeling a their predecessor! She was an incredibly brave woman by all accounts. An inspiration to all of us that have followed in her footsteps. Mary Dohey, Air Canada F/A was the first living person to be awarded the Cross of Valour. She was the mail intermediary when Paul Cini, a highjacker terrorized Flight # 812 out of Calgary Alberta on Nov 12th 1971.. Yes I know Chicks fly planes Barbara Harmer left school at 15 to become a Hairdresser and she went on to become Britains first female Concorde pilot. Wow, this article literally had a few tears running down my cheek! Amazing!